Here we envisioned a pre-Millennium Wheel structure with cabins in continuous motion. 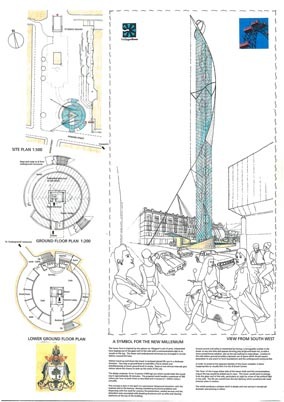 The proposal shows a hybrid form of Ferris wheel and Paternoster where pods are entered at ground level, travel up to the top of the structure and then down again, discharging visitors to the cafe on the lower ground floor. The cafe affords breathtaking upward views to the structure as seen through a suspended glass roof . 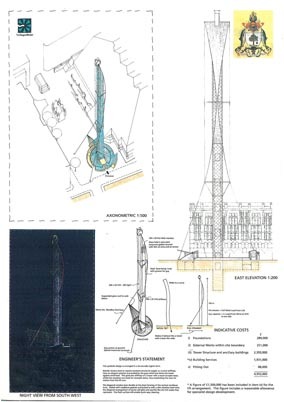 In the pan-european competition attracting 350 entries this design reached the 12-strong shortlist. Judges included Lord Norman Foster, the Burrell Company and Stuart Gulliver.